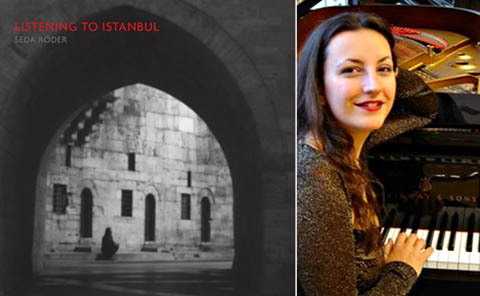 Turkish pianist Seda Röder has been around these parts more than a few times; sometimes for her wonderful playing and sometimes for her wonderful podcasts. Now an Associate at Harvard, since coming over to the U.S. in 2007 (after graduating the Mozarteum in Salzburg) Seda has been a bit of a whirlwind when it comes to new music. Not content to take the standard performer’s trajectory, Seda gives almost equal measure to not onlyconcertizing, but also informing and promoting on behalf of the lesser-known — both newer and older — corners of modern classical music. Of course, in one of the corners most dear to her lies the work of living Turkish composers, a corner most of us have never paid any attention to. Now Seda has taken a pretty big step on the way to rectifying that gap in our awareness: first, with the release of her new CD Listening to Istanbul, a collection of six newly-commissioned piano works by Turkish composers both established and emerging; and second, through a marvellous accompanying website that amplifies the CD and the works on it with all kinds of extra information, background, notes and interviews with the composers themselves.